Step Three: Prepare to get hair mussed. As has been pointed out many times, the Nuclear Posture Review is, at heart, a review. In and of itself, it does not formally change or set U.S. government policy. 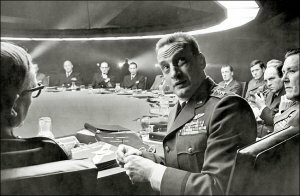 That falls to follow-on actions like presidential decisions— what this administration calls “Presidential Policy Directives”—as well as implementing edicts from relevant actors like the Joint Chiefs and U.S. Strategic Command. Sometimes these actions also require the support of Congress. For its part, while presenting some significant policy decisions, the Obama administration’s NPR also calls for a remarkable number of studies and further analysis, which I’ll list and discuss in a follow-on post shortly. Prominent among those is a look at further reductions in the stockpile below the levels in New START. Now that we are almost a year past the release of the NPR, how far has the administration advanced on the studies and on implementing the NPR? With one or two exceptions, neither the studies nor the directives have progressed very far, if at all. The reason for this provided by the administration is understandable and comes down to two words: New START. On the obvious side, it was busy getting the treaty approved by the Senate, and that took a lot of work. Less obviously, the administration did not want talk of further cuts undermining its case for this treaty. The President’s goal of a world free of nuclear weapons had already drawn plenty of flak from conservative critics, despite the luke-warm “perhaps not in my lifetime” caveat; why give opponents more, um, ammunition? That guidance then led the Joint Chiefs to create the “Nuclear Supplement to the Joint Strategic Capabilities Plan,” listed as JSCP-N on the chart. This version of that document, extracted in heavily redacted form by Hans Kristensen, provides guidance for “preparing and coordinating plans to deploy and employ nuclear weapons.” More specifically, that means the type of targets to be hit and the damage that needs to be inflicted on them. 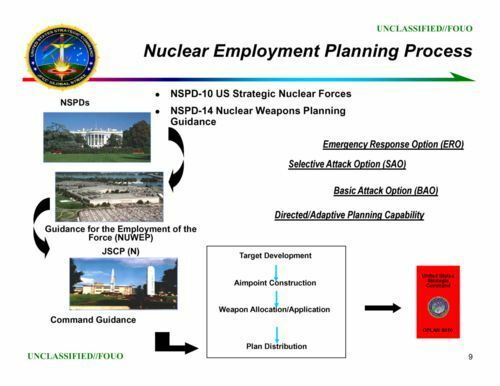 That guidance, provided to the Combatant Commanders (formerly known as CINCs) and heads of the services, in turn leads to “Command Guidance,” essentially a list of specific objectives to fulfill the JSCP-N. All that then comes back and is combined into the nuclear warplan, known for many years as the “SIOP” or Single Integrated Operational Plan, but now known as OPLAN 8010. It describes in detail the various plans that are presented as options for the U.S. Strategic Command for actually using weapons: targets, aimpoints, and weapons allocations, meaning which warheads on what delivery vehicles will be used for what targets. The system can lead to outcomes any outside observer might call irrational. For example, when he reviewed the target set in 1991, General Lee Butler, then the head of what is today U.S. Strategic Command, noted that one target in Russia had 69 separate U.S. nuclear warheads dedicated to its destruction. Let’s hope that has changed. For the Obama administration, I’m told that work on the new presidential directives—to be led by the National Security Council—is still in the early stages and not circulated widely in the administration, if at all. Based on the chart, NSPD 10, dated December 21, 2001, and NSPD 14, dated June 28, 2002, are in line to be updated or replace. I’ve also heard that NSPD 28, “United States Nuclear Weapons Command and Control, Safety, and Security,” dated June 20, 2003, is up for change. This makes sense given the prescriptions in the NPR on maintaining the arsenal and the new focus at the National Nuclear Security Administration on calling for improvements in the safety and surety of warheads in the U.S. stockpile (but that’s a debate for another time). That said, one might presume that the scenarios involving chemical and biological threats are not huge force drivers that require many warheads, so the reductions in forces might be modest if any. In another, later post, we’ll look at additional ways that the NPR could lead to reductions in the required level of U.S. nuclear forces. In the meantime, we’ll next look at the studies and analyses that are required by this NPR, and examine the question of whether the administration should complete those studies before it undertakes the presidential directives that, through the many-layered process described above, generate the nuclear war plan.